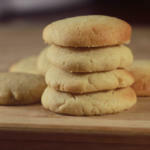 This sugar cookie recipe is traditional, classic home made sugar cookie, and easy to make. You can make them from scratch! The output is a soft and chewy cookie that you will surely enjoy eating. In a big bowl, stir together butter and sugar until light and fluffy for about 3 minutes. Put the egg and then vanilla. Stir until well combined. Gradually add the mixed flour and baking powder. Continue to stir. Place cookie dough onto baking sheet, spacing about 1 1/2-inches to 2 inches apart. Lightly press each cookie down. Bake for 8 to 10 minutes or until lightly browned. Let it cool. Here is a step by step video of Sugar Cookie Recipe. Do not over baked the cookies. Remove it from the oven when the edges turned slightly brown. Scoop it carefully. You can decorate the cookies however you want or you can go with the classic plain and simple.